To make it easy to find the pet memorial you're searching for, we've categorized our pet cremation urns by the most popular groupings. 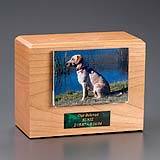 Find memorials for a specific breed of dog or cat, urns with photo frames and urns grouped by pet size. These easy-to-navigate collections of cat and dog urns allow you to quickly find the pet memorial best suited for you and your pet. 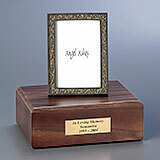 Our popular wood pet urn with an attached, acrylic photo holder. 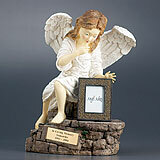 Unlike most other photo pet urns available. A creative yet subtle way to keep your friend close by. 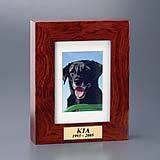 Classic wood pet urns with attractive small, large or scalloped photo frame. Exclusive to Angel Ashes. Individually handcrafted with stunning detail. 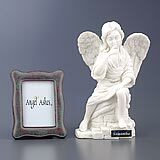 Includes an Angel Ashes exclusive photo frame. For pets up to 150 lbs. 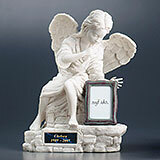 Same graceful angel and your choice of an Angel Ashes exclusive photo frame. For pets up to 30 lbs. The smallest of our angel cat and dog urns, the Keepsake Edition is for pets up to 5 lbs or for holding a portion of your pet's cremains. 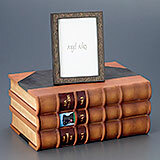 A handsome addition to any home or office, Library Edition pet urns offer a discreet place for your pet to rest. Use upright or lying down as either a pet urn or memorial for holding collars and tags.